It’s never too early to indoctrinate children into loving the films of John Carpenter. The SpaceMonkeyX Audio Workshop is doing its part to ensure that both nostalgic fans and those beginning to read can appreciate the horror master’s works by bringing back a form of entertainment from yesteryear. From the ‘60s to the ’80s, movie studios would release “read-along record books” in which children would spend 24 pages reading along to the truncated novelization of their favorite movies while a record played filled with narration, clips of dialogue, and music from the film. When the narrator on the record would finish a page, a chime would sound signaling the reader should turn to the next one. SpaceMonkeyX has brought back the format for a more savvy Internet age: By combining PDFs and podcasts it’s made John Carpenter’s The Thing the subject of its first experiment. 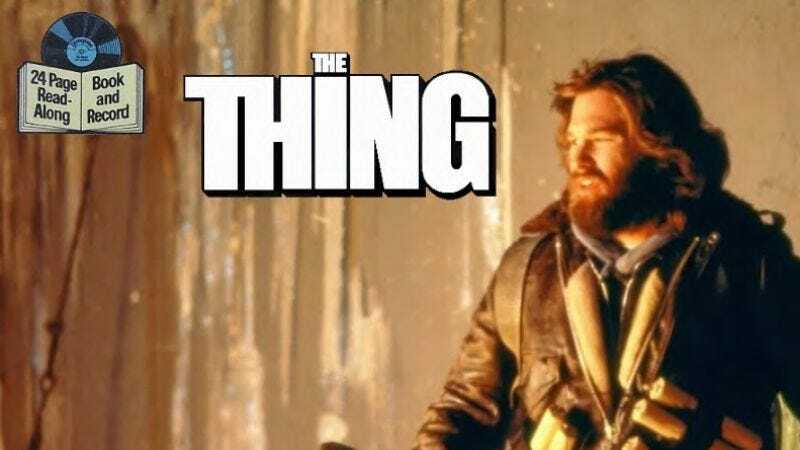 Rob Lammle wrote, produced, and narrated the The Thing Read-Along Book, bringing in an assortment of friends to fulfill various speaking parts, along with using snippets of the original film score and some new foley work for various sound effects. Steve Seward does a particularly great job with his impression of Kurt Russel as the world-weary MacReady. Readers can download the 27 page PDF and follow along as the cast recreates (a much shorter version of) John Carpenter’s landmark film known for its disturbing make-up effects and mounting paranoia. And while it may seem strange to adapt The Thing for a more kid-friendly format, the original read-along records had versions of Top Gun, Dune, Gremlins, and even 2001: A Space Odyssey. Visit SpaceMonkeyX’s site to download the PDF and read along with the cast.